Latino artists across the United States take center stage in Visiones: Latino Art and Culture, a new groundbreaking six part television series to broadcast nationally on PBS this fall. Experience the world of Latino artistic expression as the series journeys throughout the country, capturing rich stories on theater, music, dance, spoken word, and the visual arts. From New York City’s hip hop culture to mural painters in Los Angeles and Chicago to theater in Texas, the series offers a unique cross section of Latino artists working today. 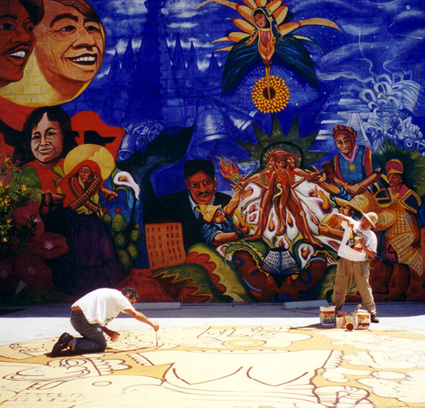 Visiones: Latino Art & Culture is the first PBS series to focus exclusively on Latino artistic expression in the U.S. The fast paced and entertaining series will capture audiences of all ages and backgrounds. Through storytelling and vivid imagery, the viewer is lead to understand the origins of Latino art and culture. It also depicts the struggles and victories that the artists endured to continue their artistic interpretation. Additionally, it examines the nation’s diverse Latino communities and how they were able to keep their artistic expressions alive while creating new and unique visions that contribute to art in America. The series incorporates extraordinary archive material to give historical depth to the ongoing work created by a new generation of Latino artists. Each episode presents six to seven stories that will electrify viewers by their sheer creative energy. Independent Latino producers based in cities throughout the country contributed story-driven segments, bringing a fresh, innovative film style that captures today’s Latino art scene. The Latino Mural Movement of the 1960’s, Nuyorican spoken word, and editorial cartoonist Lalo Lopez are featured in the first episode of the series. Created in New York, Nuyorican spoken word is a form of artistic expression that emerged from the tumultuous 1960s and continues to influence and inspire the American Puerto Rican community. The episode includes interviews with Nuyorican poets Pedro Pietri, Piri Thomas and Caridad (La Bruja). Episode two features Miriam Colon and the Puerto Rican Traveling Theater Company (PRTT) of New York, Tejana musical artist Selena, and the Santero art tradition of New Mexico. This episode unveils the stories of New Mexico artisans known as Santeros who engage in an art form heavily steeped in history and tradition. Santeros present an interesting juxtaposition of imposed religion and Native American culture. Santero artists Charlie Carillo and Nick Hernandez and historians Sabine Olivari and Sylvia Rodríguez discuss their views. Episode three features Luis Valdez and the legendary Teatro Campesino, a segment of San Antonio’s Day of the Dead Celebration, the image of the Virgen de Guadalupe as a Latina icon, experimental border filmmaker Willie Varela, and a profile of Chicago’s soapbox artist Carlos Cortez. This episode also explores San Francisco performance artist Guillermo Gomez Peña, performance troupes such as ASCO, and performance art pioneers the Royal Chicano Airforce. Episode four begins with New York’s Latino Hip-Hop and dance cultures. The Hip-Hop story looks at the new wave of Latinos who took Hip-Hop and created a culture that revolutionized the genre. It features New York Hip-Hop dancing couple Rokafella and Kwikstep. Then it travels to Miami’s unique Afro-Cuban sound. The second segment takes us to Miami to experience a music that is a blending of traditional Cuban music, explosive jazz and American Pop called the Miami Sound. Musical artist Willie Chirino is featured in this segment. The episode ends in Los Angeles with modern dance pioneer Rudy Perez. Though legally blind, Perez continues to create and inspire as a teacher and choreographer for his Los Angeles based Modern Dance Company. Episode five highlights the Taco Shop Poets of Southern California, early tent theater of the Southwest called Carpas, and performance art in San Francisco. The Taco Shop Poets, a group of Chicano poets living in San Diego, blend the spoken word with lively beats. The poets strive to take their social and political poetry to where people congregate—the Taco Shops. Episode six features the history of Salsa music and dance in Philadelphia, the first Mexican-American Prima Ballerina Evelyn Cisneros, Tejana music pioneer Lydia Mendoza, and the father of Chicano music and National Medal of Arts recipient, Lalo Guerrero. A segment unveils the trajectory of Salsa music includes commentary on world renowned performers Celia Cruz and Tito Puente. Hector Galán is an award winning independent documentary filmmaker from San Angelo in West Texas with over thirty films to his credit. He founded his Austin-based production company in 1984 and has been working as an indie director/producer ever since. His work has been broadcast nationally and internationally. His films include documentaries for PBS signature series FRONTLINE and THE AMERICAN EXPERIENCE. Galán produced the landmark four-hour PBS series special Chicano! History of the Mexican American Civil Rights Movement and more recently the six part “Visiones: Latino Art & Culture”. Galán has won awards and accolades for exploring such diverse topics as migrant farm workers, “New Harvest, Old Shame” the dynamics of race relations in the military, “The Color of Your Skin” college athletics, “Chasing the Basketball Dream”, prison riots “Shakedown in Santa Fe”, politics “In the Shadow of the Capitol” and issues surrounding illegal drugs “The Dallas Drug War”. Galán continues to create stories that explore his Tejano roots such as “Vaquero: The Forgotten Cowboy”, the acclaimed music documentaries “Songs of the Homeland” and “Accordion Dreams”, and his latest film, “Los Lonely Boys Cottonfields and Crossroads”. For a complete filmography and bio, go to Galán Inc.
Austin-based Ray Santisteban has produced and directed award winning documentaries that have aired in the U.S. and internationally on public television. He has explored subjects as diverse as a one hour documentary on New York Black Panther leader Dhoruba Bin Wahad – Passin. It On and explored the roots of Puerto Rican poetry in Nuyorican Poets Café. In 1994, he worked as an associate producer on the four part PBS series ¡Chicano! : The History of the Mexican American Civil Rights Movement. He is currently directing Voices From Texas, an hour documentary on poetry and spoken word traditions within the Mexican-American community in Texas. In addition to his film work, Santisteban also regularly contributes articles on national arts, culture, and politics, to various publications. His articles have appeared in The New York Journal of Commerce, The San Antonio Express News, The Philadelphia Daily News, The Denver Post, The Herald and Review, (IL) The Miami Herald, The Independent Film and Video Monthly and the largest Spanish language daily newspaper in the nation, La Opinion. (CA). He has also completed several radio reports as a producer and field reporter for the nationally broadcast NPR series Latino USA. Santisteban has received an .Ideas In Action Award. from the National Telemedia Association for his instruction of Madison high school students in video production, and was designated .Faculty of the Year. at the Chicano Studies program awards dinner at UW-Madison for his two term visiting lectureship in Chicano Cinema. Veronica Cavazos was born and raised on the Texas/Mexico border in Laredo, Texas and graduated from The University of Texas at Austin with a double degree in Radio-Television-Film and Mexican American Studies. At UT she completed a short documentary titled Alterlatino: The Beginnings of Rock en Español in Austin, TX that screened at Cine Sol Film Festival in the summer of 2000. She also worked as a videographer for the Independent Media Center in Philadelphia and her footage appeared in the activist video titled Public Weapon. A recipient of Latino Public Broadcasting’s Emerging Producer Fund, Veronica has begun coordinating youth related media workshops. Paul Espinosa is an award-winning Independent Filmmaker based in San Diego. Specializing in Latino and U.S.-Mexico border topics, Espinosa has produced, directed, written and hosted numerous programs for PBS. His most recent major national production credits for PBS include: The Border, a two hour news magazine about contemporary life along the U.S.-Mexico border; The U.S.-Mexican War: 1846- 1848, a four-hour, bi-national documentary series with KERA-TV in Dallas, commemorating the 150th anniversary of a war which was a pivotal event in U.S.-Mexican history; …and the earth did not swallow him, a feature length drama about one year in the life of young Mexican American boy and his migrant farmworker family; and The Hunt for Pancho Villa, produced with Hector Galán, a documentary examining Villa’s raid on the U.S. and the American expedition which was sent after him in 1916. Among the awards garnered by Espinosa’s programs are a national Emmy for News and Documentary achievement; seven San Diego Emmys; five CINE Golden Eagle awards; two Ohio State Awards; a Golden Mike Award; and major awards from the American Bar Association, the California Teacher’s Association, the California School Boards Association, the American Civil Liberties Union and National Conference on Christians and Jews. Espinosa received his B.A. degree from Brown University in Anthropology and his Ph.D. from Stanford University, also in Anthropology. Natatcha Estébanez is a Boston-based, award-winning filmmaker who has spent more than 15 years producing, directing and writing films and programs for television. She recently completed her first feature film, the critically acclaimed The Blue Diner, winner of this year’s prestigious Alma Award for Outstanding Independent Motion Picture. The film has aired on HBO and will broadcast again on PBS later in the fall of 2003. She recently completed work on another PBS Series Human Race, which will air next year. She has produced and directed 12 films for the favorite Poem Project also for PBS, as well as four films for the Discovery channel and the Animal planet channel. She also worked with Henry Hampton, founder of Blackside, Inc. and creator of the acclaimed series Eyes on the Prize on Breakthrough, a four part series about the struggles and contributions of multicultural scientists to the scientific field. Currently, she is a regular contributor to the WGBH series Greater Boston Arts. Natatcha.s work has screened in many countries including the U.S., Canada, Mexico, Spain, Italy, France, Argentina, Peru, the Dominican Republic, Germany and Cuba. Her films have won numerous awards including the Gold Award from the Corporation for Public Broadcasting, the Silver Award from the New York Film and Television Festivals, four regional Emmy Awards, and the Gold Award at the Houston International Film Festival. Rick Leal is a Dallas based producer/director formerly assigned to KERA.s public affairs program On the Record. His producing credits include Squadron 201: Mexico’s Aztec Eagles, a documentary about a squadron of Mexican fighter pilots that trained in the U.S. and fought in the Pacific during World War II; Palo Alto: A Battle That Changed America, a historical documentary that chronicles the first battle of the U.S. Mexican War and its impact on American history; Pearl Harbor Survivors: Their Story, an oral history documentary that retells the attack on Pearl Harbor, and Taiwan: The New China, a four-part documentary that investigated the history, culture, politics and economy of the island nation. Leal’s most recent production, Little Mexico/El Barrio, a 30 minute documentary that uses interviews, personal photos, memorabilia and home movies to retell the stories of past and present residents in one of Dallas’s oldest neighborhoods, earned a Merit Finalist Award from Worldfest Houston. Leal has also received a Katie Award for his 1997 piece, Freedman’s Cemetery. Rick Leal is a graduate of the University of Texas at Austin with a B.S. in Radio-Television-Film and a B.A. in Government. Cervando David Martinez is an Independent Filmmaker from San Antonio, TX. His production credits include Eros: A Film About Direct Action, a first hand, cinema verité style film about the protests that disrupted the meetings of the WTO in Seattle in 1999; The Frog in the Well, a documentary about Hoh-Kun Yuen, an archivist who documented radical social movements in Berkeley, California from 1963 until his death in 1997; Rabbits Tale, a filmed version of a Zapotec trickster legend and Vivo en Un País Libre, a short documentary about Cubans exiling their native country on homemade rafts. Martinez received his M.F.A in Radio-Television-Film from the University of Texas at Austin. Los Angeles based Severo Perez is an award-winning writer, playwright and filmmaker. His career includes experimental films in the 1960′s, PBS documentaries, live-action and animated educational films, and dramatic productions. He served as director, writer, and co-producer of his first film, …and the earth did not swallow him, an adaptation of Tomás Rivera.s critically-acclaimed novel about Mexican migrant farmworkers. Other credits include Willa Brown, an American Aviator, a documentary about the life of pioneer Black aviator Willa Brown; Speak Only of Cats, the opening play for the Mark Taper Forum’s New Work Festival in December, 1998; and Soldierboy, (written with Judith Anne Perez) developed while a Playwright-in- Residence with Luis Valdez and El Teatro Campesino. He has won numerous awards for his commercial and industrial film work. His first feature film …and the earth did not swallow him, has won 11 international awards including the Gold Medal at the 12th Annual Television Movie Awards (1997); the Jury Award at the Vina del Mar International Film Festival in Chile, 1996; the Sol Award at the CineSol Latino Film Festival, 1995; the Best Feature at the Minneapolis Rivertown Film Festival, 1995; the Premio Mesquite Best Feature Film at the San Antonio Cinefestival,1995; Jury Award Best Director, Cairo International Film Festival in Egypt, 1994; and the Best Feature San Diego Independent Film Festival,1994. Rachel Mira Perez, a graduate of the film program at California State Monterey Bay, has written, directed and produced PSA’s and programs for television. Ms Perez’ Visiones segment features postmodern dance pioneer/choreographer Rudy Perez. She is currently working with her father to expand the Visiones segment into a hour-long documentary about Rudy Perez’ fascinating career. She was also recently awarded the Latino Public Broadcasting Emerging Producers grant for her film Woman With Earrings. Her 2001 film True Stories is distributed by Filmakers Library, NYC and plays at universities and high schools across the country. She has studied dance with the prestigious Alvin Ailey Dance Company, Bella Lewitzky Dance Company, Francisco Martinez DanceTheatre, and Charles Edmondson, among others. Born and raised in Miami, FL, Yvette Pita received a B.A. in English and creative writing from Davidson College in North Carolina and began freelancing in production and as an editor in Miami and at Universal Studios Orlando. Later, she attended the graduate directing program at New York University’s Tisch School of the Arts where she was a National Hispanic Foundation for the Arts scholar and was granted a full scholarship through a position as a graduate teaching assistant. Her first film, Pan y Libertad, was a prize winner at the 2002 HBO Urbanworld Film Festival, the San Antonio Underground Film Festival and was nominated for the DGA East Best Latino Student Filmmaker award and the New York Women in Film and TV award. The short documentary premiered at the 2002 SXSW Film Festival in Austin, TX and also screened as an official selection at the Chicago Latino International Film Festival, the Florida Film Festival, the CineSol Latino Film Festival, the New York Latino International Film Festival, the Atlanta Urban Media Makers Film Festival, and the San Francisco Bay Area Latino Film Festival. Pita has taught at the New York Film Academy and was a Visiting Professor for the graduate program in Screenwriting and Film Studies at Hollins University in Roanoke, VA. She is also completing a fictional short and a feature-length documentary about her family’s first visit to Cuba in over 40 years. Alex Rivera is a New York based digital media artist and filmmaker. Through the past 5 years he’s made work in digital video and on the internet that addresses concerns of the Latino community through a language of humor, satire, and metaphor. In his first video, Papapapá, he used the rhetoric of the internet to make metaphors about his father’s experience of immigration. Papapapá won a Silver Award at the New York Expo of Short Film and Video, a Silver Hugo at the Chicago Intercom Competition, and a First Work Award from the San Antonio Cinefestival. It has been screened on PBS/WNET.s .Reel New York. series at the Museum of Modern Art, the Robert Flaherty Film Seminar, Lincoln Center, The Guggenheim, the Lussas Festival in France and other domestic and international film festivals. Rivera has received support from various foundations including The Rockefeller Foundation, The Sundance Institute, Creative Capital, The Jerome Foundation, The New York Foundation for the Arts and The US/Mexico Fund for Culture. John Valadez, a New York based Independent Filmmaker, is a noted producer, writer, and director. His credits include director of Passin. It On, an hour long documentary about the life, false imprisonment and release of a former leader of the Black Panther Party in New York City; writer, director, and producer of Soul Survivors, the first hour of the four part documentary series entitled Making Peace, a program that uses video diaries to tell the story of two activists, writer Luis Rodriguez and Clementine Barfield; and producer of the second hour of a four hour PBS series entitled Matters of Race, a film about race, ethnicity and the changing face of America. He is currently in production on The Head of Joaquin Murrieta, a ninety minute historical documentary about the life and legend of a 19th century Mexican who gained notoriety as bandit/hero during the California gold rush. Valadez, a Rockefeller Fellow (1994) and New York Foundation for the Arts Fellow (1993, 1998), has won numerous awards including the Golden Gate Award at the San Francisco International Film Festival, the Grand Prize & Best Non-Fiction Film at the USA Film Festival, the Gold Plaque Award at the Chicago International film Festival, the People.s Choice Award at the EarthPeace International Film Festival, and the Silver Apple Award at the National Educational Film Festival. He has also been nominated for a National Emmy Award and has been featured in the Berlin International Film Festival, Cinema Du Reel, and FESACO, INPUT .93. John Valadez has a B.F.A. in Film from New York University, Tisch School of the Arts. Gustavo Vazquez, a film/videomaker living in San Francisco, is an assistant professor in the film and digital media department at UC Santa Cruz. Vazquez has directed over thirty productions, including documentaries, video installations, and dramas. Some of his work focuses on the Chicano-Latino experience and social and political commentary on the cultural dynamics of the changing American landscape. Vazquez was commissioned to produce and direct a video installation, Who Am I?, for “Chicano Now,” an interactive, multimedia exhibit currently touring museums in the United States. His other credits include El Charal (The Minnow) and The Great Mojado Invasion. He has served as Festival Director for the San Antonio CineFestival and curated Mexico Videowaves, series of contemporary videos by Mexican artists for the Exploratorium in San Francisco. Vazquez is the recipient of several awards, including The Rockefeller Media Fellowship and the Eureka Visual Artists Fellowship from the Fleishhacker Foundation. He received a B.F.A. in film from the San Francisco Art Institute, and an M.A. in film from San Francisco State University.